Do you hate to pay up to $20 for a jug of laundry detergent that is mostly water? Do you buy it anyway because it is convenient? Would you make your own if it was cheap, quick, and easy? The only three ingredients are Dawn Ultra, borax, and washing soda. I picked up all three at my local Walmart. If you can’t find the washing soda, use this great Arm & Hammer store finder. You could also go to a home center or pool supply store and see if they have a bulk container of soda ash (sodium carbonate). It might also be called “pH Up” or something similar. I paid a little under $1 per pound for the Arm & Hammer washing soda. The alternatives may be more expensive. 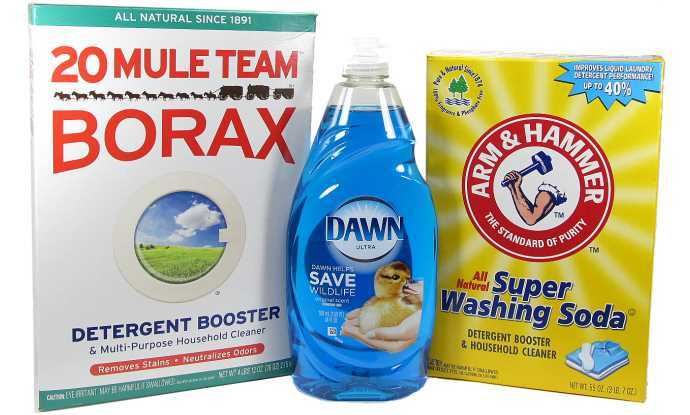 Dawn Ultra, borax, and washing soda are the three ingredients used to make this homemade laundry detergent. Next we need a bottle to put it in. I found the Arrow 2.2L bottles at my local Dollar General. Walmart and Publix have them as well. They are slightly larger than 1/2 gallon. I like them because they are clear, sturdy, and the lid seems to be watertight. Also they are not super-heavy when full. 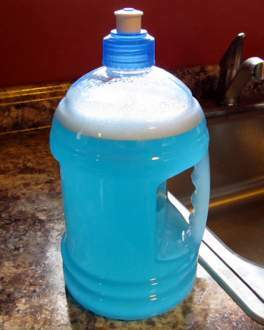 A gallon jug of detergent weighs around 10 lbs. That is a lot of weight to hold and try to precisely pour. This is a 2.2 liter (74.4 oz) water bottle. It has a watertight cap and is useful for holding homemade cleaning solutions. We will also need a set of measuring cups and a standard funnel. 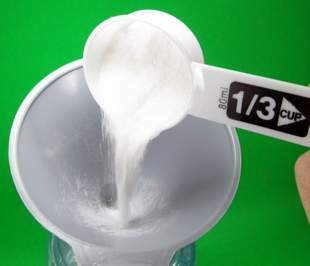 If you want to make a gallon of detergent in a gallon container, just double the amounts of each ingredient. 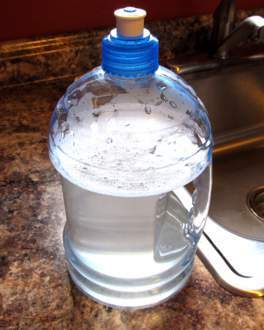 Place your funnel in the 1/2 gallon bottle. Pour 1/3 cup of the borax into the bottle. Pour 1/2 cup of the washing soda into the bottle. DO NOT put the Dawn in yet . It will make too many suds at this point and we don’t want that. Pour 1/3 cup borax into the bottle. Pour 1/2 cup washing soda into the bottle. Now fill the bottle about a 3/4 of the way up with hot tap water. You want to leave enough headroom for the Dawn. 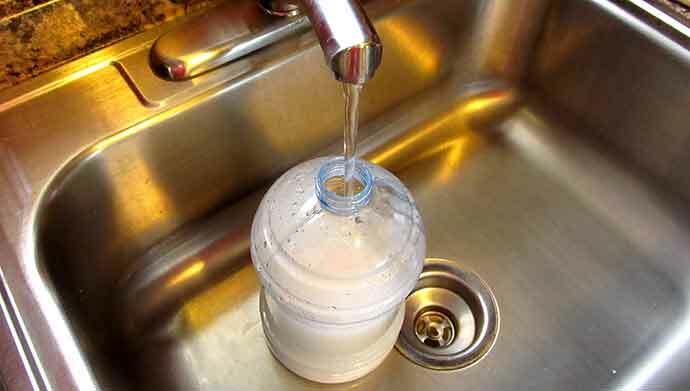 After putting the borax and washing soda into the bottle, fill it up about 3/4 full with hot water out of the tap. Put the lid back on and shake up until most of the borax and soda is dissolved. Now measure 1/2 cup of Dawn Ultra and pour it into your bottle. To mix it up, just turn the bottle upside down and then back upright a few times until it is all the same color like the bottle below on the right. Mixing up the borax and washing soda first prevents suds. Here is the finished detergent. After it sits awhile, the detergent will settle out like the bottle on the right. 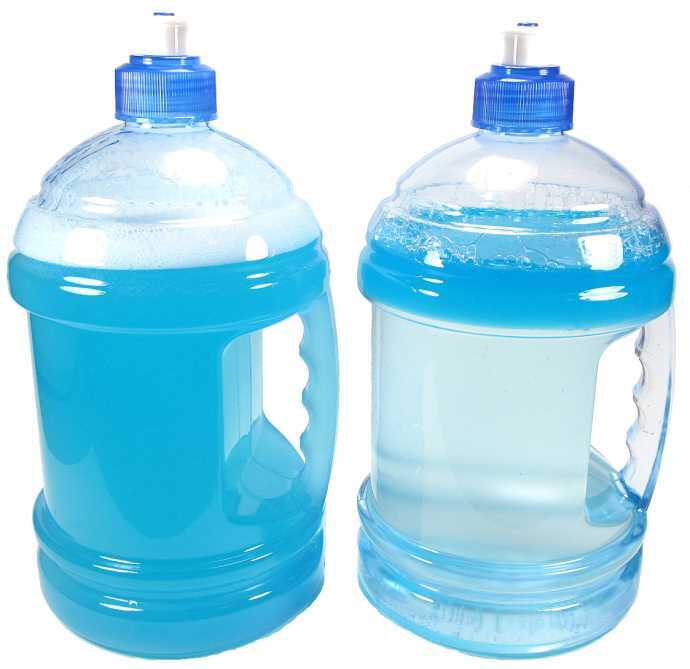 Just flip the bottle upside down and back up a few times and it mixes back up to look like the detergent on the left. There may be some undissolved crystals on the bottom. Don’t worry about these. You can either pour them out when the bottle is empty or you can pour them in the washer. They will dissolve once they hit the wash water. 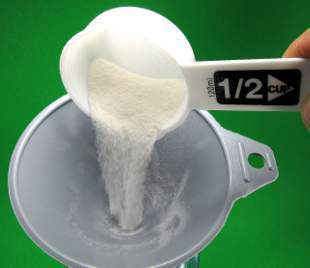 To use, just measure and pour 1/4 cup of detergent to an average load. That is all you need. If you have very hard water, an old washer that uses lots of water, or you are washing a load of greasy shop rags, you can use more. 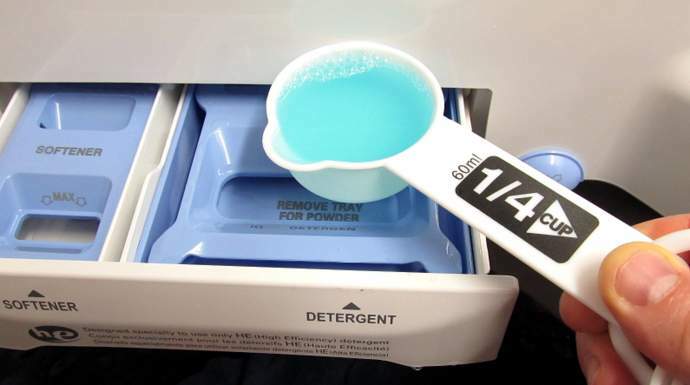 Just be aware that most people use far too much detergent when doing normal loads. 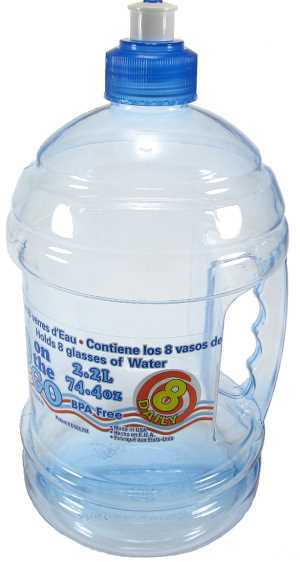 I used to fill up the cap when I washed clothes. Now I realize that I was using around 10 times the amount of detergent that I really needed. Too much detergent wears your clothes out faster, shortens the life of your washer, and creates an environment for mold and mildew. This is me pouring the homemade detergent into our LG WT1201CW top-load washer. 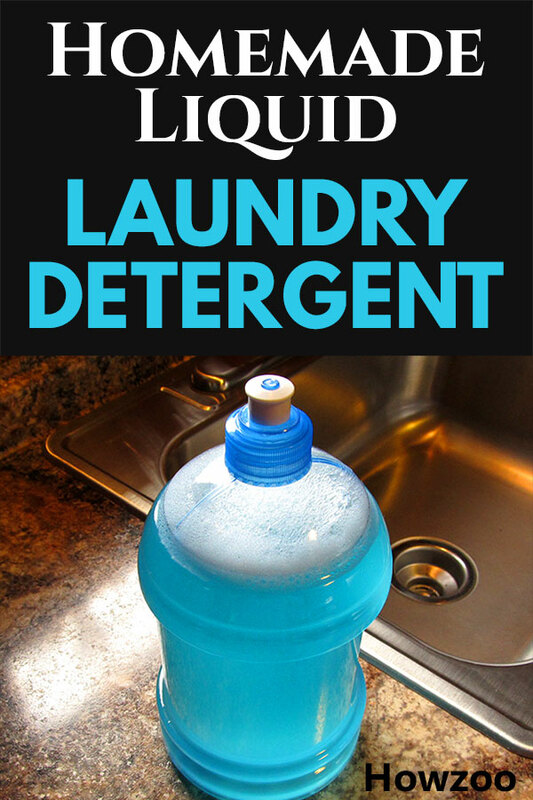 I have used this homemade laundry detergent recipe in my new LG WT1201CW high-efficiency top loader. This is a huge washer that will easily wash a king-sized comforter. The detergent seems to be doing a good job. I have noticed a “fresh” smell to the clothes when I take them out of the washer. The ingredients to make 1/2 gallon cost about $0.90. 1/2 gallon of this detergent will do about 32 loads. This comes out to less than 3 cents per load ! I am very happy about this because I love to save money ! Please feel free to make your comments and suggestions below. Do you think this mixture will work okay in HE front-load machines? Or, will it cause too much sudsing? Thanks in advance. Also, thanks for all the great info on your site. This mixture is thinned down quite a bit, so it doesn’t make a lot of suds. It really depends on how much you use. If you use too much of any detergent, even the HE kind, then you can get too much sudsing. If your machine is still under warranty, you may want to use a store-bought HE detergent so that you don’t have any warranty issues. Some manufacturers might try to get out of a warranty claim if you tell them you are using homemade detergent. Thanks for the quick reply. I have a top-load HE and will use it as you suggest. I asked about using it in a front-load machine for a friend. I tried a thinner version of your ingredients that I found on another website. I wasn’t very impressed with the results though. It was okay on lightly soiled laundry, but did nothing for heavier soiled items, (soil that Tide would normally take care of without pretreating). Even though the lightly soiled items appeared clean, it still made me wonder if they were really actually clean, or just appeared to be because they weren’t that dirty to begin with. That’s why I searched again for homemade laundry detergent, and landed on your page. I never thought I’d say it, but I can’t wait to test your detergent on my next load of heavier soiled laundry. Let me say that this recipe is intended for light, everyday washing of items like towels, socks, office clothing, etc. If you have been out working in the dirt or you have greasy stains on your clothes, this detergent will probably not be strong enough. If you have tough stains or heavy soil, pre-treating with a powdered “Oxy” stain remover and then washing with a product like Tide is recommended. I have also been known to pretreat tough stains with a little Dawn straight out of the bottle. We’ve been using this formula, from another source, for about four years. It does exactly what the article claims. It saves you a lot of money over a year and, if anything, the clothes smell fresher. I have been using for 2 yrs and do everything from regular laundry to clothes from my dirty greased hand an husband and everything comes clean! Easy to make and 1/4 cup does the job! Do you have any experience in using this with people with sensitive skin? I haven’t heard from anybody that mentioned any skin reactions. But I am sure there are some people that would be allergic to the dyes or solvents. If that is this case, you could use this dye-free hypoallergenic Dawn in the recipe. Since Dawn has Triclosan, and I get better results with powder anyway, do you have to use Dawn, or can you just get rid of it altogether? What about Castile soap? Can you add fragrance essential oils singly or in combinations? For this recipe you do need the Dawn. Regular Dawn does not have any triclosan. That was the “antibacterial” version that used to have that. I have seen many other recipes for homemade laundry detergent. Some use Castile soap and essential oils. But I would not use them with this recipe. Hopefully sometime in the future I can post a recipe for a powder version that uses Castile soap and/or fragrant oils. I use dawn ultra mixed with some standard degreaser at the janitorial supply (2 Parts dawn 1 part degreaser) with water to shampoo scrub very dirty carpets before I steam clean them. The formula turns the hardest carpets to get clean into very easy carpets to get clean with my steam cleaner follow up. (Sometimes it causes too much foam/suds to form but that’s usually because I poured too much mix in with the scrub water.